Is there anything worse than getting to the gym and realizing your headphones are at home? Music is an integral part of a workout and for good reason. It helps us overcome hitting the wall on a long run, eke out the final reps in a HIIT session, and lift massive amounts of weight to achieve a PR. Science attests to that. Music affects the mind profoundly, and knowing how it happens can mean working harder with less discomfort. Translation: less pain, more gain. Sure, you can throw on some Kendrick Lamar and get sweaty. Nothing wrong with that. But we’ve taken things one step further. Below, you’ll learn exactly why music and fitness feed off each other, and how to sync your reps with the rhythm of the beat for maximum impact. Talk about the power of music. Put someone in an MRI machine, pipe in Zeppelin, and watch their brain light up. “There’s stimulation from sound, the emotional response from lyrics, even memories you associate with it,” says Jessica Grahn, who runs a music and neuroscience lab at Western University in Ontario. When it comes to working out, music can lock us into the grind and distract us from pain. A study in the International Journal of Psychology found that listening to music blocks some of the messages between muscles and brain. Your head doesn’t get the, “I’m tired, slow down!” alerts from biceps or lungs, and you’re less aware of fatigue. And to state the obvious, music makes the workout more fun. “It raises moods, distracts attention, and provides a pleasurable stimulus during tough workouts,” says study author Costas Karageorghis of Brunel University London and author of Applying Music in Exercise and Sports. That push is especially helpful when you’re going all-out, like in a cycling or indoor running class. A study in Medicine & Science in Sports & Exercise found that when people did sprint interval workouts with and without music, they performed significantly better with tunes. And that’s when the progress happens. Not to say you can’t reach your fitness goals to the sound of silence. But it’s more fun to get in the groove, and changing up your music can give a tried-and-true workout a new life. Consider the strength routine below, created by Sturm. You’ve probably done these moves a million times. But by syncing them to the beat, and playing around with the tempo (how many beats you use to lift or lower the weight), you’re taxing your muscles differently. Toying with tempo, dumbbell weight, and reps makes for infinite possibilities. We’ve created four playlists to cater to your musical taste and designed to pump you up. All the songs are around 120 to 140 beats per minute, the right tempo for living weights. So invest in a good pair of wireless headphones (yeah, we’ve got a few ideas for those as well), and get ready to work it. Moving in sync with music actually makes your body work more efficiently. In a U.K. study, a group of indoor cyclists were told to pedal at a steady rate while listening to songs with different BPMs. When the song’s BPM matched up to the pedal strokes, the athletes needed 7 percent less oxygen to complete the distance. Running with the beat is especially important when you’re aiming to remain on pace or improve your splits. And the new Weav Run app is a novel way to do it. Created by a Google Maps programmer and his wife, the app can match your cadence by automatically raising or lowering a song’s BPM to follow your footfalls, or you can set the BPM (usually at a faster pace than you’re used to) and keep up with the beat. The app remixes the song in real time, using algorithms that were individually coded for each song. Meaning that Run-DMC’s “It’s Tricky” (128 BPM) sounds just as good at 180 BPM (the cadence needed to run a seven-minute mile). The best part: Many users don’t even notice they’re working harder and running faster. It’s $8 per month. Ever hear a song that makes you want to jump out of your seat and move? It’s not just you. The area of your brain associated with movement will light up when you listen to music even if you’re completely still. It proves there’s something about music that’s innately tied to motion. So when you’re lacing up to go run or lift, throw on a song with a high BPM (like Tom Petty & the Heartbreakers’ “Runnin’ Down a Dream,” at 172 BPM), which will help you come out of the gate hot. The term entrainment describes the body’s biological tendency to align its rhythms—respiration and heart rate, brain wave patterns, etc.—with a music’s tempo. So to recover from an all-out bout (sprint repeats, HIIT training, a fast swim) more quickly, studies suggest you should tack on some slower songs to the end of your playlist at a descending tempo, starting at around 80 to 90 BPM (like the Velvet Underground’s “Pale Blue Eyes”), down to 60 BPM (Joni Mitchell’s “River”). There are 2 circuits, five moves each. Do them back-to-back, or as singles along with cardio. Aim for 8 to 12 reps per move, and do 3 full sets. With each move you’ll see an up and down arrow. That tells you how many beats to lift and lower the weight. Changing the lift pattern works muscles differently. You can also keep it simple and default to 2 beats up, 2 down. Grab a flat bench and 4 sets of dumbbells, 2 sets that are heavier, two lighter. Each move says which to use. Use the lighter in each pair for round one, and treat it like an active warmup. For the lighter set, work up to 15 to 20 pounds, and 30 to 40 pounds for the heavy set. Lie face-up on a bench, feet on the floor, a heavy dumbbell in each hand. Press both dumbbells overhead to start. 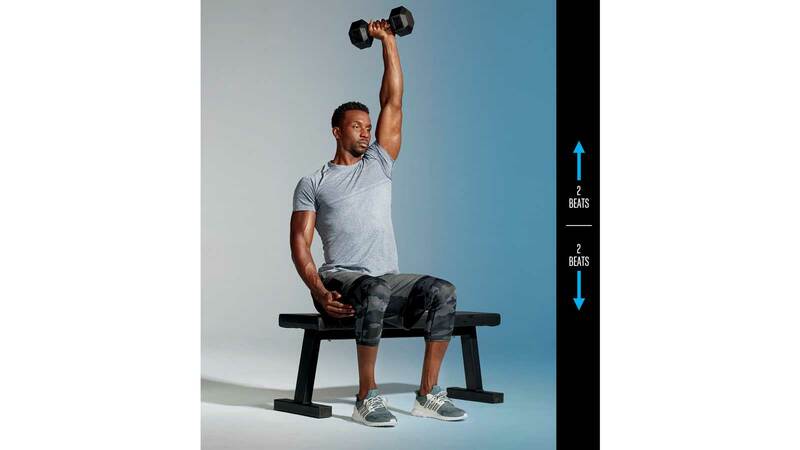 Keeping dumbbell in left hand elevated, perform a chest press with right hand only. Do all reps on right side, then switch sides. Extend arm overhead in 1 beat, lower slowly to chest in 3 beats. 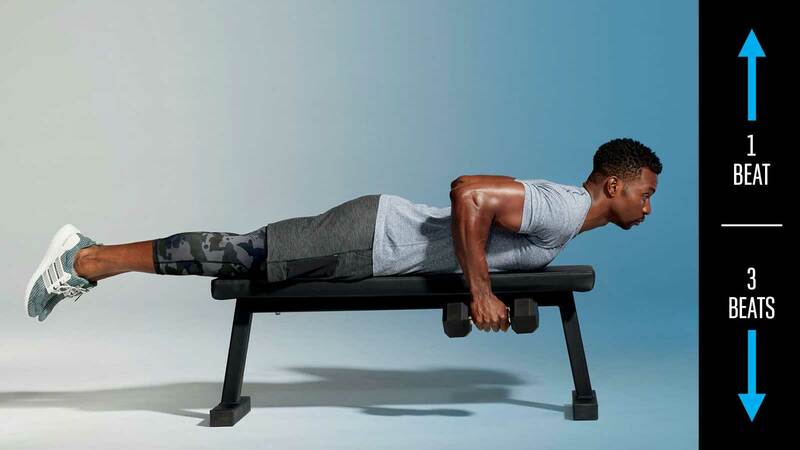 Lie face-down on a bench, legs straight, a light dumbbell in each hand. Lift chest off bench and draw shoulders up beside ribcage to start. Lift weights back so arms are straight back, then return to start for 1 rep. Lift weight in 2 beats, then lower in 2 beats. Sit on bench, feet on floor, a heavy dumbbell in left hand, holding it at shoulder level to start. Press dumbbell overhead, then return to start for 1 rep. Do all reps on left side, then switch sides. Extend arm overhead in 2 reps, return to shoulder in 2 reps. Lie face-up on a bench, feet on floor, holding a heavy dumbbell, arms straight overhead, to start. Bend elbows and engage triceps to bring dumbbell just behind head, then press up for 1 rep. Drop weight behind head in 2 reps, press up in 2 reps.
Start with feet shoulder-width apart, a heavy dumbbell in each hand start. Bring left dumbbell to shoulder-height, then return to start. 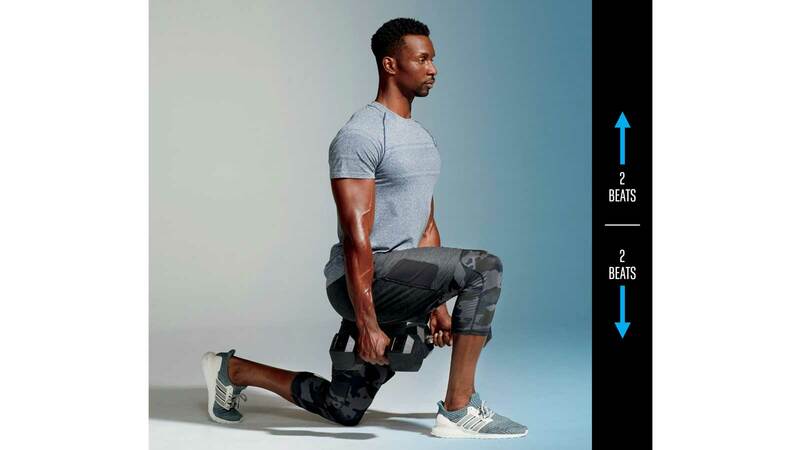 Repeat on right side for 1 rep. Move quickly, lifting weight in 1 rep, lowering in 1 rep.
Start on hands and knees in tabletop position, left leg back and extended, a straight line between heel and head, dumbbell in right hand to start. Keeping back flat, draw right elbow up until dumbbell is neat bottom of rib cage. 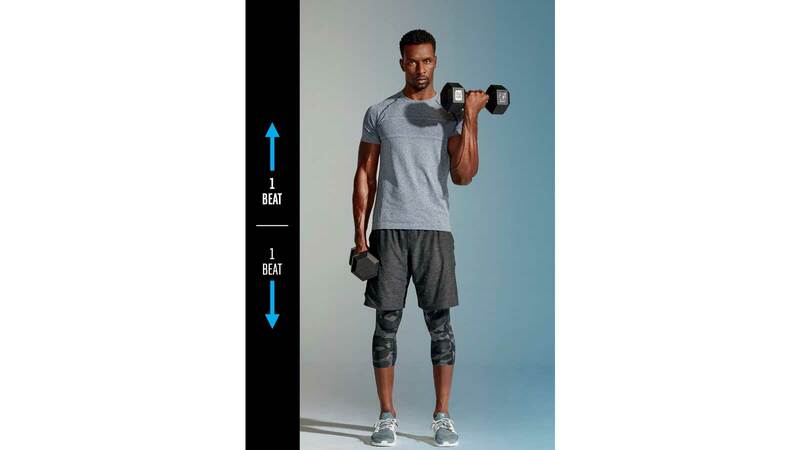 Return dumbbell toward floor for 1 rep. Keep left leg elevated during the entire set, and complete all reps on the right before switching to the left. Lift the weight in 2 beats, lower in 2. Stand with feet wider than shoulder-width apart, feet slightly turned out, holding dumbbell vertically and beneath chin to start. Keeping chest tall and resting thumbs against sternum, squat, then stand for 1 rep. Drop into a squat in 2 beats, rise to stand in 2 beats. Lie on a bench, a heavy dumbbell in each hand. 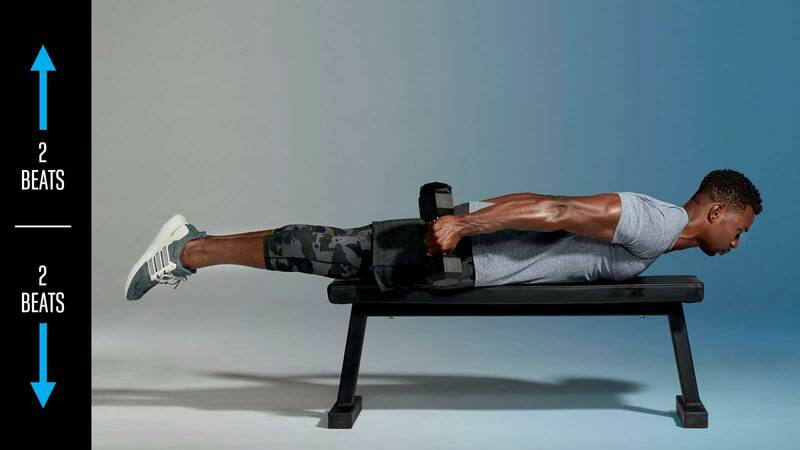 Straighten legs and raise chest to start. Squeeze together shoulder blades and draw elbows up until they are above your back. Reverse movement to lower weights toward floor for 1 rep. Raise weight in 1 beat, lower to floor in 3 beats. Sit on the edge of a bench, heels directly underneath knees, a light set of dumbbells on each side. Grab dumbbells in each hand and hinge torso forward until weights hang beneath shoulders to start. Engage abs and back, and in one strong movement, draw weight away form the midline of the body, keeping a slight bend in elbows. Release down for 1 rep. Lift dumbbells in 1 beat, and lower slowly in 3 beats. Hold a heavy dumbbell in each hand to start. Step forward with right foot, dropping left knee to floor. Lift left knee slightly, then return to floor, and stand. Step left foot forward and repeat lunge for 1 rep. 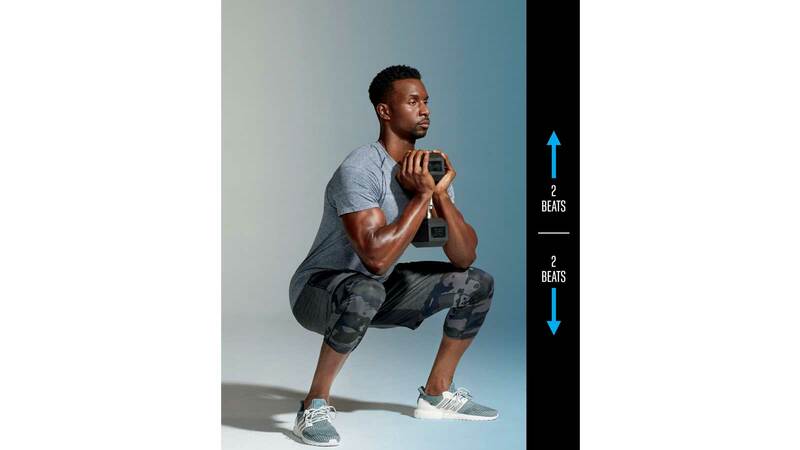 The whole move takes 4 beats total: Lunge forward, pulse up, drop back down, stand, each in one beat.